Poppy is the common name for any of the plants comprising the Papaver genus in the flowering plant family Papaveraceae, characterized by large, showy, terminal flowers growing on long, hairy stalks, and flower buds that are nodding or bent downwards, turning upwards as they are opening. While members of this genus are known as "true poppies," the term poppy also is used to refer to numerous similar plants with showy flowers in other genera of Papaveraceae (the poppy family), with members of the family characterized by nodding buds, production of a milky latex juice, and flowers typically found one per stem. The flower color of poppy species include: white, pink, yellow, orange, red, and blue; some have dark center markings. The species that have been cultivated for many years also include many other colors ranging from dark solid colors to soft pastel shades. Poppies include a number of attractive wildflower species with showy flowers found growing singularly or in large groups; many species are also grown in gardens. Those that are grown in gardens include large plants used in a mixed herbaceous border and small plants that are grown in rock or alpine gardens. Poppies are well-loved for their striking flowers, with several species grown as ornamental plants, such as the California poppy (Eschscholtzia californica. The common poppy or corn poppy (Papaver rhoeas) is still worn in remembrance of World War I. Ecologically, many are important as pollen sources for bees in exchange for pollination of the plants. 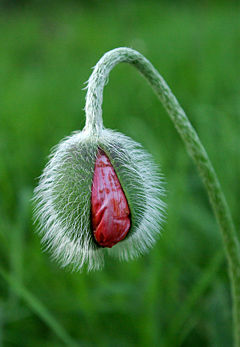 However, the reputation of poppies is not all positive as one species is the opium poppy (Papaver somniferum), which is the source of opium and other opiates, which have a history of abuse as illegal drugs. However, the opium poppy also provides most of the poppy seeds used in cooking and baking, and various opiates used medicinally. Poppy is the common name for plants with showy flowers belonging the Papaver genus and related genera in the poppy family, Papaveraceae. 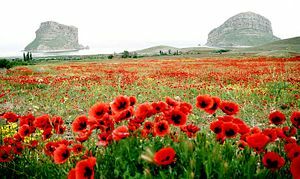 Papaveraceae is a family of flowering plants occurring in temperate and subtropical climates. Most are herbaceous plants, but a few are shrubs and small trees. Members of Papaveraceae are laticiferous. All parts contain a well developed duct system (these ducts are called "laticifers"), producing a milky latex, a watery white, yellow or red juice. The simple leaves are alternate or sometimes whorled. They have petioles and are not enclosed by a sheath. The leaves are usually lobed or pinnatifid (i.e., consisting of several not-entirely separate leaflets), or much-divided. There are no stipules. Papaveraceae plants are hermaphroditic and are pollinated mostly by insects (= entomophilous), while a few are pollinated by wind ( = anemophilous). There is a distinct calyx and corolla, except in Macleaya where the corolla is lacking. The flowers are medium-sized or large and they generally look spectacular. The terminal flowers are solitary in most species. In others, the terminal inflorescence is cymose or racemose. The flowers are odorless and regular. There are many stamens, mostly 16 to 60, arranged in two separate whorls, the outer one with stamens alternate with the petals, the inner one opposite. The gynoecium consists of a compound pistil with 2 to 100 carpels. The ovary is superior and 1-locular. The ovary is without a footstalk (sessile) or on a short stem (stipitate). The whorl of stamens in the center of the flower is surrounded by a cup- or bowl-shaped collection of four to six petals. Prior to blooming, the petals are crumpled in bud, and as blooming finishes, the petals often lie flat before falling away. The non-fleshy fruit is usually a capsule, breaking open at maturity to release the seeds through pores (poricidal), or through the partitions between the cells (septicidal), or by means of valves (valvular). The numerous seeds are small. Their nutritive tissue (endosperm) is oily and farinose. The fruit of Platystemon is a schizocarp. Members of Papaveraceae almost all contain alkaloids. Many are poisonous. The Mexican prickly poppy is poisonous if taken internally and may cause edema and glaucoma. Even if an animal, such as a goat, should persist in grazing on this plant, not only will the animal suffer but so will those who drink its milk, because the poisons are passed along in the milk. Meconopsis—— Himalayan poppy, Welsh poppy and relatives. Papaver—— Iceland poppy, Oriental poppy, Opium poppy, corn poppy and about 120 other species. Romneya—— Matilija poppy and relatives. Eschscholzia—— California poppy and relatives. Stylophorum—— Celandine-poppy, mock poppy, yellow-poppy, wood-poppy. The "true poppies" in the genus Papaver include around 120 species, including the opium poppy and corn poppy. These are annual, biennial, and perennial hardy, frost-tolerant plants growing natively in the temperate climates of Eurasia, Africa, and North America (Canada, Alaska, Rocky Mountains). One section of the genus (Section Meconella) has an alpine and circumpolar arctic distribution and includes some of the most northerly-growing vascular land plants. The large, showy terminal flowers grow on long, hairy stalks to a height of even one meter or more as in the oriental poppy (Papaver orientale). Their colors vary from the deepest crimson, lilac, or white, or violet, to bright yellow or soft pink. The tissue-paper-like flowers may be single, double, or semi-double. The size of these flowers can be amazing, as the Iceland poppy (Papaver nudicaule) grows to 15-20 centimeters across. The flower buds are nodding or bent downwards, turning upwards as they are opening. There are two layers. The outer layer of two sepals drops off as the bud opens. The inner layer consists of four (but sometimes five or six) petals. There are many stamens in several whorls around a single pistil. The pollen of the oriental poppy, Papaver orientale, is dark blue. The pollen of the field poppy or corn poppy (Papaver rhoeas) is dark blue to gray. Bees will use poppies as a pollen source. Poppies have a long history in human civilization. They were already grown as ornamental plants since 5,000 B.C.E. in Mesopotamia. They were found in Egyptian tombs. In Greek mythology, the poppy was associated with Demeter, goddess of fertility and agriculture. People believed they would get a bountiful crop if poppies grew in their field, hence the name "corn poppy." In this case, the name 'corn' was derived from korn, the Greek word for "grain." Poppies today are sold as cut flowers in flower arrangements, especially the Iceland poppy, and commonly have a prominent place in gardens, borders, or in meadow plantings. They are probably one of the most popular wildflowers. Poppy is widely consumed as food in many parts of Central and Eastern Europe. The sugared, milled mature seeds are eaten with pasta, or they are boiled with milk and used as filling or topping on various kinds of sweet pastry. Poppy seeds are widely used in Bengali cuisine. In the course of history, poppies have always been attributed as having important medicinal properties. The alkaloid rhoeadine is derived from the flowers of the corn poppy (Papaver rhoeas). This is used as mild sedative. The milky sap present in the opium poppy (Papaver somniferum) contains several narcotic alkaloids. Opium is a narcotic formed from the latex released by lacerating (or "scoring") the immature seed pods of opium poppies (Papaver somniferum). It contains up to 16 percent morphine, an opiate alkaloid, which is most frequently processed chemically to produce heroin for the illegal drug trade. The resin also includes non-narcotic alkaloids, such as papaverine and noscapine. Cultivation of opium poppies for food, anesthesia, and ritual purposes dates back to at least the Neolithic Age. The Sumerian, Assyrian, Egyptian, Minoan, Greek, Roman, Persian and Arab Empires each made widespread use of opium, which was the most potent form of pain relief then available, allowing ancient surgeons to perform prolonged surgical procedures. Poppies have long been used as a symbol of both sleep and death: sleep because of the opium extracted from them, and death because of their (commonly) blood-red color. In Greco-Roman myths, poppies were used as offerings to the dead (Baum and Hearn 1973). Poppies are used as emblems on tombstones to symbolize eternal sleep. This aspect was used, fictionally, in The Wonderful Wizard of Oz to create magical poppy fields, dangerous because they caused those who passed through them to sleep forever (Baum and Hearn, 1973). A second meaning for the depiction and use of poppies in Greco-Roman myths is the symbolism of the bright scarlet color as signifying the promise of resurrection after death (Graves 1990). The poppy of wartime remembrance is the red corn poppy, Papaver rhoeas. This poppy is a common weed in Europe and is found in many locations, including Flanders Fields. This is because the corn poppy was one of the only plants that grew on the battlefield. It thrives in disturbed soil, which was abundant on the battlefield due to intensive bombing. During the few weeks the plant blossomed, the battlefield was colored blood red, not just from the red flower that grew in great numbers but also from the actual blood of the dead soldiers and civilians that lay scattered and unattended on the otherwise barren battlegrounds. Thus the red poppy became a symbol for the deceased World War I soldiers. In many Commonwealth countries, artificial, paper versions of this poppy are worn to commemorate the sacrifice of veterans and civilians in World War I and other wars, during the weeks preceding Remembrance Day on November 11. Although the drug opium is produced by "milking" latex from the unripe fruits ("seed pods") rather than from the seeds, all parts of the plant can contain or carry the opium alkaloids, especially morphine and codeine. This means that eating foods (e.g., muffins) that contain poppy seeds can result in a false positive for opiates in a drug test. While popularized in an episode of the television comedy series Seinfeld, this was considered "confirmed" by the presenters of the television program MythBusters. One participant, Adam Savage, who ate an entire loaf of poppy seed cake, tested positive for opiates 30 minutes later. A second participant, Jamie Hyneman, who ate three poppy seed bagels, first tested positive two hours after eating. Both tested positive for the remainder of the day, but were clean 18 hours later. The show Brainiac: Science Abuse also did experiments where a priest ate several poppy seed bagels and gave a sample, which also resulted in a false positive. The results of this experiment are inconclusive, because a test was used with an opiate cutoff level of 300 ng/mL instead of the current SAMHSA recommended cutoff level used in the NIDA 5 test, which was raised from 300 ng/mL to 2,000 ng/mL in 1998 in order to avoid false positives from poppy seeds (Erowid 2007). However, according to an article published in the Medical Science Law Journal, after ingesting "a curry meal or two containing various amounts of washed seeds" where total morphine levels were in the range 58.4 to 62.2 µg/g seeds, the urinary morphine levels were found to range as high as 1.27 µg/mL (1,270 ng/mL) urine (Lo and Chua 1992). Another article in the Journal of Forensic Science reports that concentration of morphine in some batches of seeds may be as high as 251 µg/g (Pelders and Ros 1996). In both studies codeine was also present in the seeds in smaller concentrations. Therefore it is possible to cross the current standard 2,000 ng/mL limit of detection, depending on seed potency and quantity ingested. Some toxicology labs still continue to use a cutoff level of 300 ng/mL. The sale of poppy seeds from Papaver somniferum is banned in Singapore due to the morphine content. Poppy seeds are also banned in Saudi Arabia due to various religious and drug control reasons (Faisal 2006). Close-up of an oriental poppy (Papaver orientale) Ontario, Canada. June 2002. A poppy bud and plant. Immature crowning Opium Poppy, top view. Closeup of a poppy flower in private garden, Derbyshire, England, UK, May 2007. Closeup of a poppy flower at the Monastery of Lorch, Baden-Württemberg, Germany. Field of poppies, from a photograph by Sergei Mikhailovich Prokudin-Gorskii, taken ca. 1912. A wild field of poppies, above the Wye Valley, UK. Poppies near Kelling, North Norfolk, UK. Baum, L., L. Frank, and M. P. Hearn. 1973. The Annotated Wizard of Oz: The Wonderful Wizard of Oz. New York: C.N. Potter. ISBN 0517500868. Erowid. 2007. Opiates and drug tests. Erowid.org. Retrieved December 7, 2007. Faisal, S. 2006. Ignorance is no excuse for breaking law. Arab News January 10, 2006. Retrieved December 7, 2007. Graves, R. 1990. The Greek Myths. Harmondsworth, England: Penguin Books. ISBN 0140010262. Lo, D. S., and T. H. Chua. 1992. Poppy seeds: Implications of consumption. Med Sci Law 32(4): 296-302. Retrieved December 7, 2007. Pelders, M. G., and J. J. Ros. 1996. Poppy seeds: Differences in morphine and codeine content and variation in inter- and intra-individual excretion. J Forensic Sci 41(2): 209-212. Retrieved December 7, 2007. This page was last modified on 22 May 2015, at 20:53.